Redmatica has announced that, after more than two years of development, it is previewing the next generation of its creative sampling applications, Compendium Pro Bundle 2 at the Winter NAMM show, booth 6328 Hall A. The new set of applications include Keymap Pro 2, AutoSampler 2 and ProManager 3 and offers both evolutionary and revolutionary features by building over the solid foundation of Keymap 1.5, AutoSampler and ExsManager 2. The Compendium Pro Bundle 2 is set to be released in Spring 2009, with price TBA. Keymap Pro 2 is the direct evolution of the Keymap 1.5 sampled instruments editor, and extends its file support to all the major instrument formats on the market, including Apple EXS24, Native Instrument Kontakt, Digidesign Structure and Propellerheads Reason 4 NNXT. 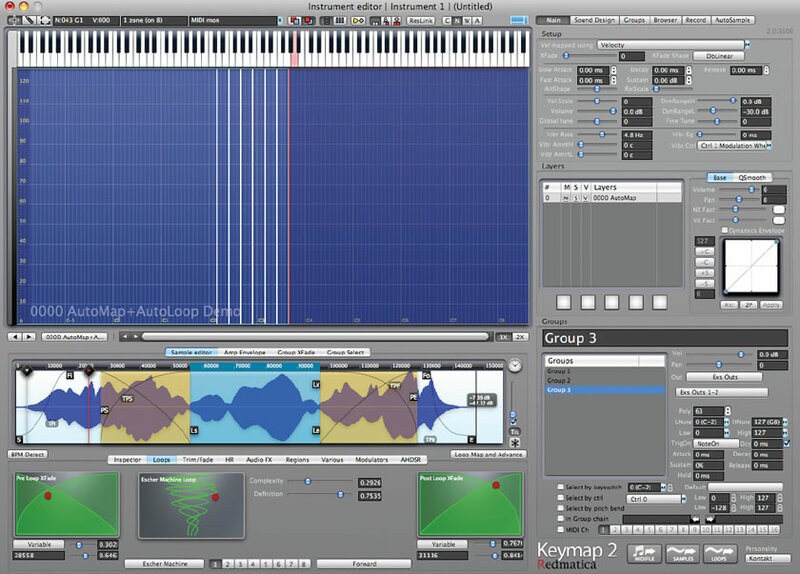 Keymap Pro 2 incorporates many new features, including multiple playback personalities to match each corresponding instrument format, integrated direct multichannel recording (sampling) also from networked computers with autostart/stop/cut/map/loop, new DSP tools for looping the unloopable, new resynthesis algorithms for non-harmonic samples, integrated AutoSampling features with AutoSampling Live mode for effortless interactive recording of sounds from sound sources, SoundDesign layers for using AudioUnit plugins as synthesis blocks in the playback chain, massively multimode envelopes, dimensional panning, continuous background rendering, and a Core Animation based visual interface. 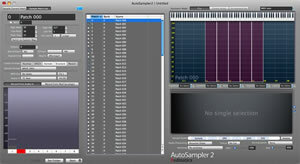 AutoSampler 2 takes the original tool for automatically sampling hardware and software synths to 2009 by presenting a new user interface and extending instrument creation format support to Redmatica Keymap, Apple EXS24, Native Instrument Kontakt, Digidesign Structure and Propellerheads Reason 4 NNXT. 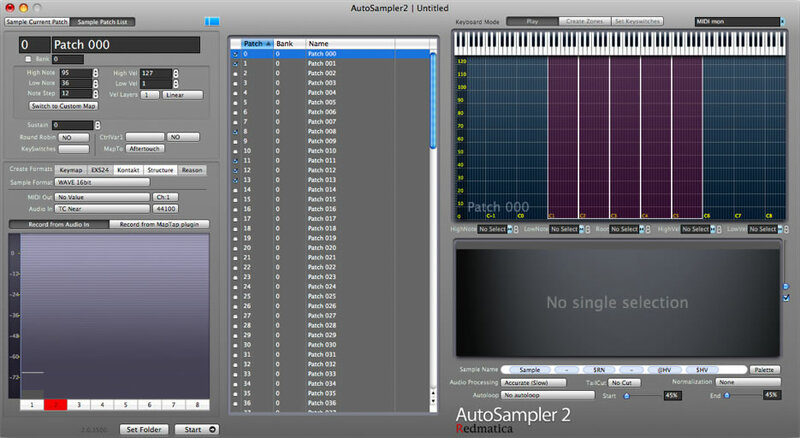 It now also offers a built-in mapping editor to build custom templates, a new simplified view mode, autolooping algorithms taken directly from Keymap Pro 2, multichannel autosampling up to 8 channels from local audio devices or networked computers, Key Switch autosampling, Round Robin autosampling, and much faster operations. 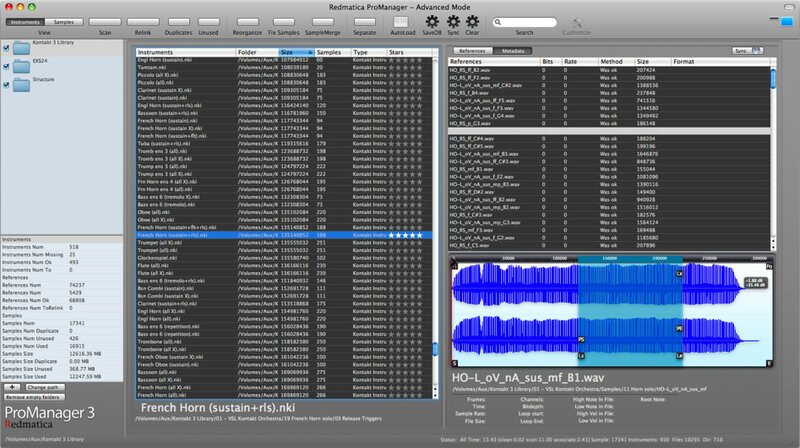 ProManager 3 is the completely redesigned next generation of the popular ExsManager sampled library manager application, and now handles Redmatica Keymap, Apple EXS24, Native Instrument Kontakt, Digidesign Structure and Propellerheads Reason 4 NNXT instruments formats simultaneously. The intuitive goal-based interface makes easy to relink instruments to samples for quick loading, or manage duplicate and unused files, or to completely reorganize the sample libraries. 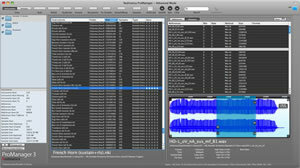 ProManager also offers browsing capabilities for both instruments and samples, an integrated streaming sample viewer, metadata tagging, search and synchronization over the network. ProManager also introduces SampleMerge 2.0, a new function for consolidating the sample files for instruments in a single, standard Wave/Aiff format, sample file monolith. "'Revolutionary Evolution' was the concept behind the entire development of the Compendium Pro Bundle 2. 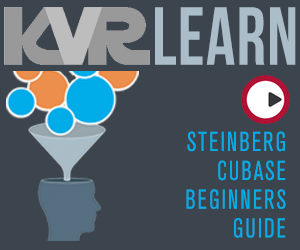 We didn't just want to introduce a killer set of new features, but also offer new ways to use already existing technologies. All I can say is that we are tremendously excited about what we are going to release in a few months. ", said Andrea Gozzi, Founder and Technical Director of Redmatica. "You can now use your AudioUnit plugins not just as effects, but as synthesis blocks for sound design, dynamically allocated exactly as the standard filters for each voice in a synthesizer, unleashing new ways to create imaginative, organic, expressive, ground breaking sounds from a standard set of samples. But our goal is always the user experience, not just the technology, and even when we went into the ambitious design process for the new DSP looping tools in Keymap Pro 2, we never forgot how often it's the simple thing that changes the experience. The simple fact that you have a Record button always ready to be used, or that you can actually see your edits animate, changes everything already." The applications in the Compendium Pro Bundle 2 will also be available separately, and Redmatica also announced the Compendium Bundle 2, Keymap 2 and ExsManager 3. 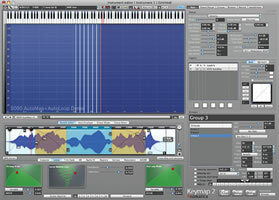 Keymap 2 retains most of the features of Keymap Pro 2, including support for the same instrument formats, and ExsManager 3 is the EXS24-specific version of ProManager 3. A complete range of upgrade options from the current offerings to the new versions will also be offered at prices TBA.